The Tehachapi Valley Healthcare District is taking input on future use of the old hospital location at 115 W. E St. Residents of the Tehachapi Valley Healthcare District are waiting for news of what will become of the now vacant hospital at 115 W. E. St., while board members are still deciding its future use. The topic was discussed at the district’s March 19 board meeting. “There is still interest in leasing the old hospital building out for medical office space, since that goes along with the district's mission. I hesitate to move forward with a decision for the old hospital,” said Caroline Wasielewski, district manager for TVHD. Wasielewski said the district and Adventist Health Tehachapi Valley still need to formally “hand over of the keys” and discuss the future of the small clinic next to the vacant building. The community's top choices as expressed during strategic planning workshops over the last four months are for a long-term senior care facility, holistic center or childcare center. The district owns the vacant building at 115 W. E St., along with two small buildings that serve as a rural health clinic and physical therapy office space, plus the new, current hospital at 1100 Magellan Drive. Adventist Health is leasing these buildings and is the tenant, said a 2016 Master Facilities Lease between the district and Adventist Health. Some areas at the old building have strong concrete walls. It contains a variety of space. The district may have to renovate to meet current building codes if the building is vacant after one year, or if the use changes, said Jay Schlosser, development services director for the city. “There should be funds to renovate the building if we continue to own the old hospital,” said Chester Beedle, chief financial officer for the district. There is currently more than $1 million available to use for any remodeling needs, he added. Property taxes fund any improvements or projects and may be used if in line with the district’s mission, said board President Mike Nixon. 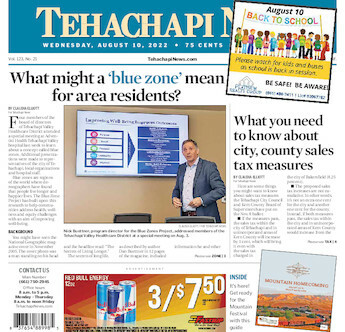 In other business, the district is planning to partner with the Tehachapi Valley Healthcare District Guild to purchase a 64-slice CT scanner and echocardiogram machine. Can district funds be used to pay off bonds? No. Taxpayers agreed to pay for taxes on the bonds and the regulations are specific. The ad valorem taxes are designed for district operations, said Caroline Wasielewski, district manager for TVHD. How much is left to pay off bonds? The $65 million bond measures have amounted to $125,273,204 in total debt. This equals the total principal and interest, which includes refinancing on some series of debt issuances, said Janelle Austin, division chief of special accounting for the Kern County Auditor Controller. Taxpayers of the healthcare district will be paying on some bonds until 2029, and others until 2043. How many staff does the district have?